It was decided not to send an expedition in the following year but to wait until the spring of 1924 and return with renewed and well planned determination. There was a change in the Chairmanship of the Mount Everest Committee, it was the turn of the President of the Alpine Club, General Bruce, who had also been chosen to lead the Expedition. Hence he became both Chairman of the Committee and leader of the Expedition. A second in command was deemed necessary in case of emergency. Colonel Norton was chosen. He could speak Hindustani, had a good knowledge of Indian hill men and being a staff officer had much experience in organization and leadership. However, since the 1922 Everest Expedition, in which he had performed well, he had been serving in the Dardanelles in North-western Turkey. Luckily the troubles had subsided there and with a little persuasion the Military Authorities in England released Norton to join the Expedition. Somerville, a skilled surgeon, was working in a Mission in Southern India but was able to get away for four or five months to join the Expedition. He too had given a good account of himself on the 1922 Expedition. 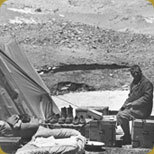 Odell, a geologist, was in Persia and managed to organise the few months necessary, he had wanted to join the previous expedition but had been unable to obtain leave of absence. Mallory, a schoolmaster, had been on the previous two expeditions. During the last expedition he had been involved in two serious accidents, in one seven men had lost their lives. The Committee very much wanted him to go but would it be fair to ask him? Delicate approaches were made and much to their relief he accepted. Bentley Beetham, a schoolmaster at Barnard Castle School, was described as not having the same concentrated fire as Mallory but that he was perpetually boiling, bursting and bubbling over with keenness and enthusiasm. The kind of man that nothing less than a ton of bricks could keep down. It was said that it was fortunate for the School that the Alps were fairly accessible so that Beetham might annually let off much loose steam. Andrew Irvine, at the age of twenty-two and an undergraduate at Oxford University was the youngest of the Expedition. Longstaff and Odell had seen him at work on the Oxford Spitzbergen Expedition in 1923, and had strongly recommended he be invited. Hazard, an engineer by profession, had an excellent mountaineering record and had served in India as a sapper. Major RWG Hingston of the Indian Medical Service was chosen as the medical officer and naturalist to the Expedition. Captain Noel, although not a climber, had been almost the keenest of all to see Everest climbed. 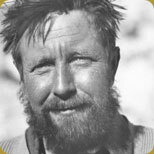 He came forward with proposals for the cinematographic and photographic rights which enabled the Expedition to proceed. Noel was financially supported by Mr Archibold Nettlefold and others. 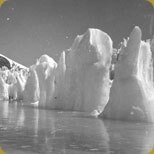 Having received permission from the Tibetan Government the 1924 Everest Expedition entered the final planning stages. General Bruce and Colonel Norton started out to India ahead of the rest and reached Delhi on the February 18th 1924. There Lord Rawlinson, Commander in Chief in India, gave them every assistance and encouragement. The son of an old President of the Royal Geographical Society, he was keenly interested in the Expedition and made the way easy for Captain Geoffrey Bruce to join the Expedition, and for the services of four Gurka non-commissioned officers to be placed at General Bruce’s disposal. On the 29th February 1924 Mallory, Irvine, Beetham and Hazard set sail from Liverpool destined for Bombay aboard the SS California, en route to Darjeeling in Northern India to join up with the rest of the Expedition. By the 1st of March the nucleus of the Expedition had formed in Darjeeling; General Bruce, Norton, Geoffrey Bruce and Shebbeare of the Indian Forest Department who was to act as Transport Officer. 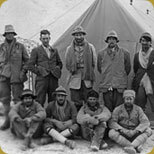 Climbers returning from the 1922 Expedition were Colonel Edward Norton, George Mallory, Howard Somervell and Geoffrey Bruce along with Captain John Noel who would film the Expedition and General Charles Bruce who would once again be the leader. For others such as Bentley Beetham, Andrew (Sandy) Irvine, John Hazard and Noel Odell it was their first time on the mountain. The Expedition made use of the Planters Club in Darjeeling as a base, a favoured social gathering spot for the elite of the area, and from here organised much of the logistics and hired help. Photographs of the members of the 1924 Expedition can still, to this day, be found hanging in the snooker room of the Planters Club. On the 25th of March the Expedition left Darjeeling to journey north through Sikkim up onto the Tibetan Plateau following a route almost identical to that of 1922. The main problem was to advance into Tibet at the latest possible time to avoid the worst of the winter weather but at the earliest possible moment so that the expedition could arrive at the foot of Mount Everest with sufficient time to make an assault before the weather broke at the start of the monsoon. The uplands of Tibet between Phari and Khampa Dzong, particularly the Dongkar-La, were bleak and cold, but with the experience of 1922 behind them they travelled in far greater comfort. However, it was during this time that the Expedition suffered a serious blow. General Bruce was taken down suddenly with a severe bout of recurrent Malaria, so severe that he had to hand over leadership of the Expedition to Colonel Norton and be taken back to Sikkim. From Khampa Dzong onwards the journey suffered little in the way of hardships or difficulties. Evenings in camp were often spent with oxygen drills or discussing plans of climbing the mountain. The huge baggage train that wound its way across the Tibetan Plateau consisted of 350 animals (yaks, donkeys and bullocks), these were changed at each Dzong (capital of a district) along the route. Bentley Beetham had contracted dysentery during the early part of the journey through Tibet, but refused to give in and by the time they reached Base Camp he had almost recovered. Fortunately during this whole period he continued to take photographs of the Tibetan way of life. These images of a rapidly disappearing culture add a very important dimension to the Bentley Beetham Collection. On April 23rd the Expedition arrived at Shekar Dzong where two days were spent arranging grain, meat and fuel to be regularly supplied to the Base Camp during the next two months. Here their friend from the previous year, the Dzongpen (District Governor), had ridden out to welcome the Expedition and offered every assistance in his power, giving much personal help in organising coolies to be used on the glacier in addition to their specially enlisted porters from Darjeeling. On the 26th April the Expedition crossed the Pang La pass at a height of nearly 18,000 ft. Thirty-five miles away and in full view towered Everest high above the Himalaya. Four days later, April 28th, the Expedition was camped at the Rongbuk Monastery, only a few miles from Base Camp where they arrived the following day. Not wanting to waste precious time the plan was that on the April 30th 150 local Tibetans, who had been specially enlisted through the offices of the Shekar Dzongpen, would start carrying loads to Camp 1 on the East Rongbuk Glacier. Unfortunately no sooner had the Expedition arrived in Base Camp than the weather changed and snow and wind brought a bitter cold. Wrapped in woollens and windproofs the team worked through until dusk to prepare the loads for the following day.